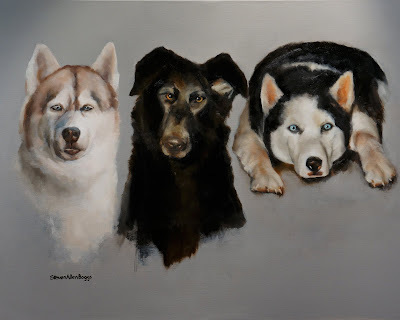 This was a commissioned portrait of three dogs. Two of them, the big brown in the middle, and the black and white on the right were done posthumously unfortunately. The brown and white on the left is very sweet and doing fine. This was an interesting painting for me because I had to work from several older photos for two of them and then create a composition that worked for all three. I hope that you enjoy the painting!